My Ryobi 160R model corded electric leaf blower came from a local lawn and garden store in Ohio. I was not planning on buying a leaf blower that day, so did not have any thoughts on what make or model I might want. I would recommend doing a little research than I did before making a purchase of any lawn equipment! Fortunately, in my case I got lucky and this leaf blower has been great. This one was on sale and it was an impulse buy. I have used it for grass clippings, leaves and even snow in the time I have owned it. The Ryobi 160R electric leaf blower is quite powerful and blows leaves quickly. It is lightweight and easy for me to use. I never thought about having one before and now wonder how I ever got by without a leaf blower. I do not rake leaves anymore, but blow them into piles and haul them away. My children have even used the blower often to make piles of leaves to jump into. I also use the leaf blower to clean off my patio and sidewalks. It will blow almost anything off the sidewalk, including small stones and mulch. It is much easier than sweeping everything off and, honestly, a lot more fun! I have used the blower in my basement also to clean up small messes. Remember – do not use a gas powered leaf blower in the basement because you could harm yourself with the exhaust. Light snow removal is a breeze with this leaf blower. It does not blow the heavy, wet snow away, but the light snows are easy to get rid of. I have a gravel driveway so it is of little use on it, but on my sidewalks and to clear a path to the mail box, it is a handy tool to have. One thing I wish I had thought of would be to purchase a gas powered leaf blower. Mine needs to be plugged in to use, and dragging extension cords all over the yard can be irritating after a while. I also had to purchase another heavy duty extension cord to use this. This is not an issue with the product itself, but a personal choice. I wish I had given more thought before I purchased a leaf blower that needed to be plugged in. 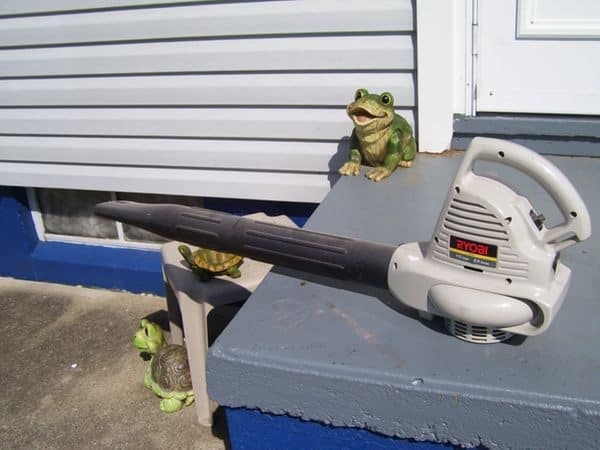 Ryobi doesn’t even make a corded electric leaf blower anymore, and only offers gas powered leaf blowers and leaf backpack blowers, as well as some cordless lithium ion electric blowers. I would highly recommend the Ryobi brand of leaf blower to anyone looking at different brands. I honestly did not know Ryobi manufactured leaf blowers. I was only familiar with Ryobi power tools. It has been a great purchase for me. I have not had any problems with the operation of this leaf blower. It was reasonably priced for someone on a tight budget. Cost was an important consideration for me, as I am sure it is for most people. Have you had a good or bad experience with Ryobi leaf blowers? Leave a comment and share your review! Please include the model number and approximate price paid, if you know. Ryobi leaf blower looks pretty handy. And you’re right, I also always prefer to look for leaf blowers that are cordless. Makes doing the job a lot easier.